Passion fruit grow on vigorous vines that cling to supports with their tendrils. Typically, the vine leaves are dark green, with a shiny upper surface. When you see those passion flower leaves turning yellow, the odds are that your vine isn’t getting the nutrients it needs from the soil. However, cold weather or insufficient irrigation could also be the culprit here. Read on for more information about yellow leaves on passion fruit vines. If you see your passion flower leaves turning yellow, it may be time to check the nutrients in your soil. Too much or too little of particular nutrients can cause yellow passion vine leaves. For example, if your soil contains too much boron, the leaf tips might yellow. Too little iron, magnesium, molybdenum, zinc or manganese can also cause yellowing passion vines. In those instances, the yellow coloring will show up particularly between the leaf veins. Likewise, a nitrogen, sulfur or potassium deficiency can cause yellow leaves on passion fruit plants. Obtain a soil sample and send it in to a local soil testing laboratory for a complete analysis. Follow the lab’s recommendations for amending the soil. In the short term, solve your vine’s problems by applying blood meal and bone meal or aged chicken manure to the top of the soil, keeping it from touching the foliage. Water thoroughly. Insufficient water can also result in yellowing passion vines. This usually happens in potted plants when the soil dries out completely. The oldest leaves are the ones likely to yellow. Regular watering will solve this problem quickly. Passion flower leaves turning yellow can be a result of cold weather, windy conditions or low humidity as well. The sheer size of the plant makes it difficult to protect when freezes threaten, but generally the many leaf layers keep the innermost foliage safe from damage. Protect your plant by choosing a planting site against a wall or deck. An attack by the cucumber mosaic virus can result in yellow passion vine leaves, or at least yellow patches on the leaves. The leaves yellow, then curl and die. Limit pest damage by controlling aphids, since these tiny soft-bodied insects spread the virus. Spray the aphids thickly with insecticidal soap until the plant is dripping wet. Repeat every few weeks if additional treatment is required. 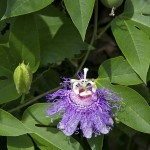 Read more articles about Passion Flower.